BRUSSELS (Reuters) - British Prime Minister Theresa May remonstrated with Jean-Claude Juncker at a Brussels summit on Friday, and the EU chief executive had to placate her after publicly calling Britain's Brexit demands "nebulous". 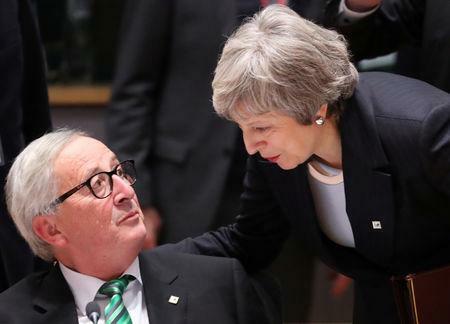 Speaking several hours later, at the end of the two-day meeting, Juncker went out of his way to say he had meant no disrespect to May, whom he called "courageous". "We sympathise with Mrs May," he told a news conference. "I have the highest respect for the British PM." The previous evening, he had told a news conference that British calls for EU help on Brexit were "nebulous" and "vague". Diplomats said other leaders made similar complaints directly to the beleaguered British leader during the talks. Under huge pressure at home as British media on Friday described her largely unsuccessful plea for help from EU leaders as a humiliation, May appeared anxious to make a point to Juncker before a new session in the morning. What they said was not audible, but official video of their exchange as other leaders took their seats showed May agitated while Juncker held her by the arm, shook his head and raised his palm in an apparent effort to calm her down before the Dutch prime minister arrived to interrupt them. May told journalists later on Friday that they had had a "robust discussion" -- "the sort of discussion you're able to have when you have developed a working relationship". The European Commission president had assured her, she said, that what he was describing as nebulous was the "general level of debate" in Britain on Brexit, not her own pitch to leaders. Juncker joked that they had kissed and made up. "We have treated PM May with much greater empathy and respect than some British members of parliament, for sure." May had on Thursday evening appealed to the other 27 national EU leaders for some legally binding amendments to the Brexit deal that she agreed with them just last month but seems unable to get through the UK parliament. But the EU stuck by its refusal to do anything that might water down the so-called "backstop", designed to avoid extensive border checks between Ireland and Northern Ireland. The leaders issued a statement stressing they hoped it would not be used, or only for a very short time. That has failed to satisfy critics of May's plan, who say the backstop opens the risk of Britain being bound by EU trade rules indefinitely, unless the two sides can agree on another way to keep their borders almost totally open.